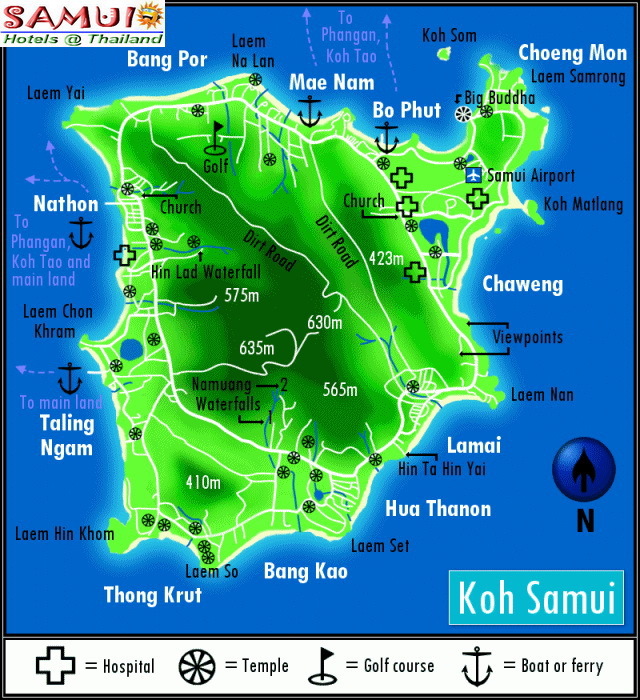 Ko Pha-ngan is located 20 kilometers directly north of Ko Samui, or approximately 100 kilometers from Surat. The best time to visit Ko Pha-ngan is fromFebruary to September. Interesting attractions include secluded and virgin beaches around the island, a hilltop temple called Wat Khao Tham which is ideal for meditation, Than Sadet Waterfall, and the Namtok Phaeng National Park. Renting a motorcycle to explore the island is recommended as there is a lot to see and do. The village is situated along the bay to the north of Pha-ngan Island. The area is lined with shops selling merchandise and souvenirs with the most popular item being dried squid. There are songthaew services from Thong Sala Pier with a fare of 50 bahts / trip / person. Apart from beaches, sand and sea, Ko Pha-ngan also has cultural attractions such as Wat Madio Wan, located at Mu 3, where the replica of the Lord Buddha’s Footprint is enshrined on the hilltop Mondop. To reach the temple, take a songthaew from for a total distance of approximately 3 kilometers for a fare of 20 bahts / trip / person. Located on the hilltop of Khao Kao Haeng, Mu 1, Bang Tai Sub-district, the monastery is ideal for meditation amidst the unspoiled nature. Foreigners mostly visit the compound to learn how to practice meditation between September and November. To reach the monastery, take a chartered car or rent a motorcycle at Thong Sala Pier and drive for approximately 3 kilometers. From the entrance of the temple, drive approximately 1 kilometer up to the compound. Located at Mu 4, Ban Tai Sub-district, approximately 12 kilometers from the District Office is the most beautiful and famous beach on Ko Pha-ngan – Hat Rin. The white sandy beach stretching for 2 kilometers is accessible by a long-tailed boat from Thong Sala Pier and Ban Kai. The fare is approximately 30 bahts and 20 bahts respectively. The Full-moon Party, with over a thousand party lovers in attendance is held on this beach. Located at Mu 5, Ban Tai Sub-district, approximately 23 kilometers from the District Office is the second most beautiful beach on Ko Pha-ngan. To reach this beach, either take a boat or songthaew from Thong Sala Pier. The songthaew fare is 80 bahts / trip / person while that of chartered boats is up to negotiation. Located at Mu 8, Pha-ngan District, approximately 10 kilometers from the District Office is the one of the most beautiful beach of Ko Pha-ngan. To reach this beach, take a songthaew from Thong Sala Pier for a fare of 40 bahts / trip / person. A charming island with jungle-covered hills, a long stretch of golden sandy beach and colorful coral reefs, Ko Tae Nai is located near Ko Pha-ngan, and can be reached just 5 minutes by chartered boats. Accommodations are available but are mostly middle to top-end.